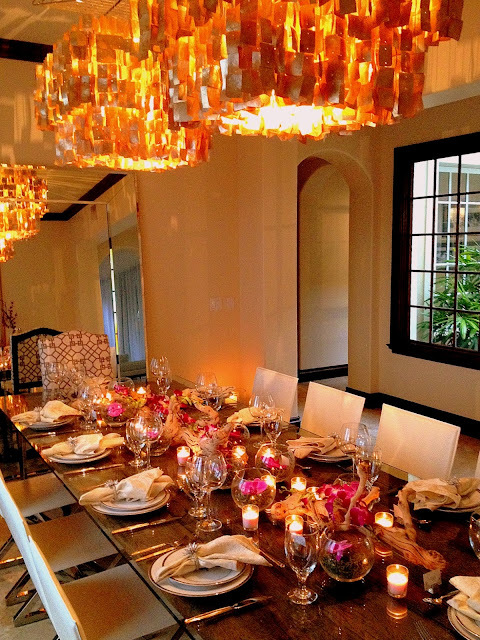 This past weekend I helped a friend and client create the most stunning table for her dinner party which was also her first since I redecorated her home. Hosting a dinner party doesn't have to be a huge undertaking. You could always make it easy on yourself by asking guests to bring a little something. I also recommend getting as much done before the day of the party such as any shopping and prep work, or possibly having things on your menu that can be prepared in advance so that on the day of you aren't going crazy. 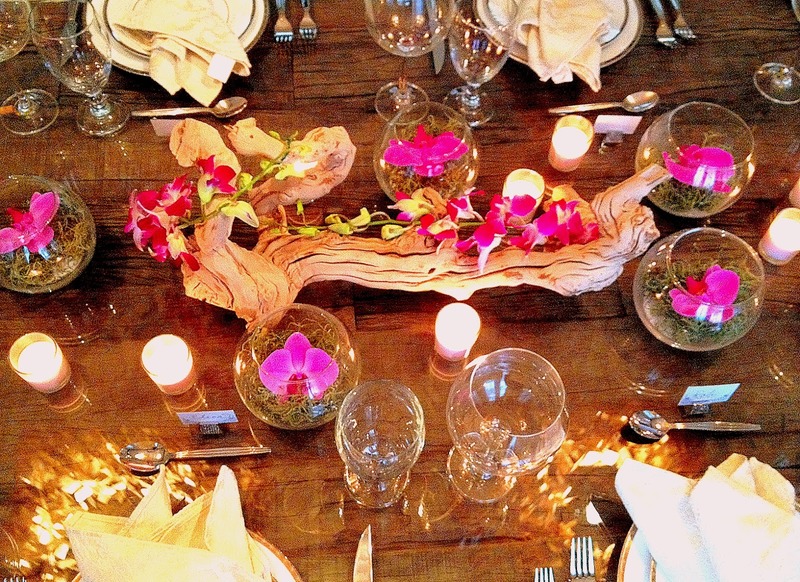 This also applies to the decor of your party or table. 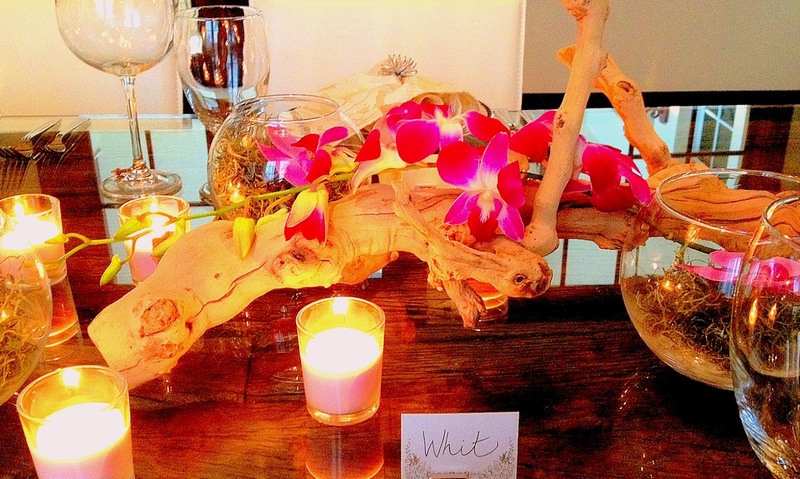 A few things that I always have on hand when entertaining are candles and flowers. You really can't go wrong with this combo and when done purposefully they will make any occasion feel special. Creating a nice table setting doesn't have to cost a fortune, and it also doesn't have to be intimidating. 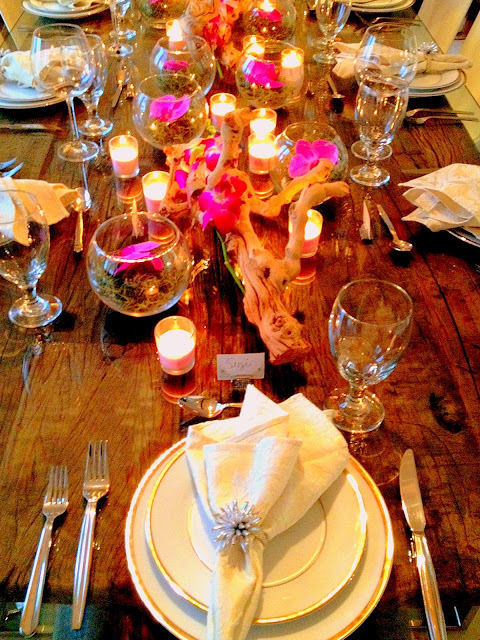 For the table above I used only a few different items which I grouped and scattered down the center of the table. Throughout my own home and in any home I decorate I don't know the meaning of the words "too many candles", or "candles only for show". I light and replace every candle in my home, and I also have them everywhere. My one tip however is to buy unscented candles as too many scents are never a good thing and can become obnoxious. 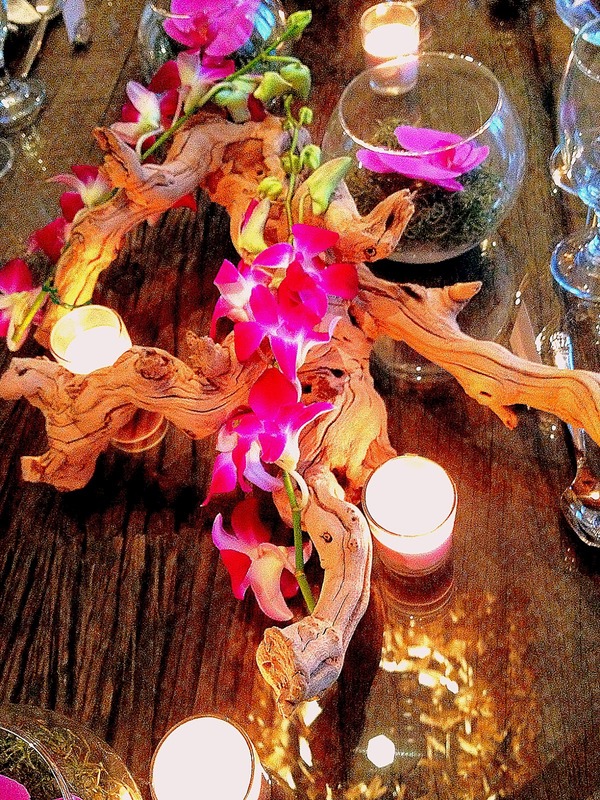 I purchased stems of orchids which I tied on manzanita branches, and I also added a single orchid to each of the 10 fish bowl vases which were lined with moss. The total cost for flowers for this party was around $30. Though I already owned the vases and branches, you can find them at affordable prices at places like Home Goods, Joanne's and Michael's or really any home store. 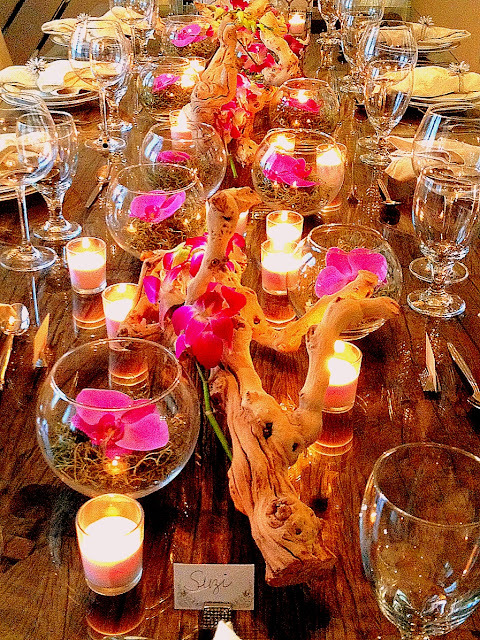 I suggest playing around with what ever you have and going with flowers that are in season. You can buy a variety bunch of flowers at the grocery store and then separate them by flower type and place them in different vases, or I have even used shot glasses with a simple rose bud clipped at the stem which turned out beautifully. 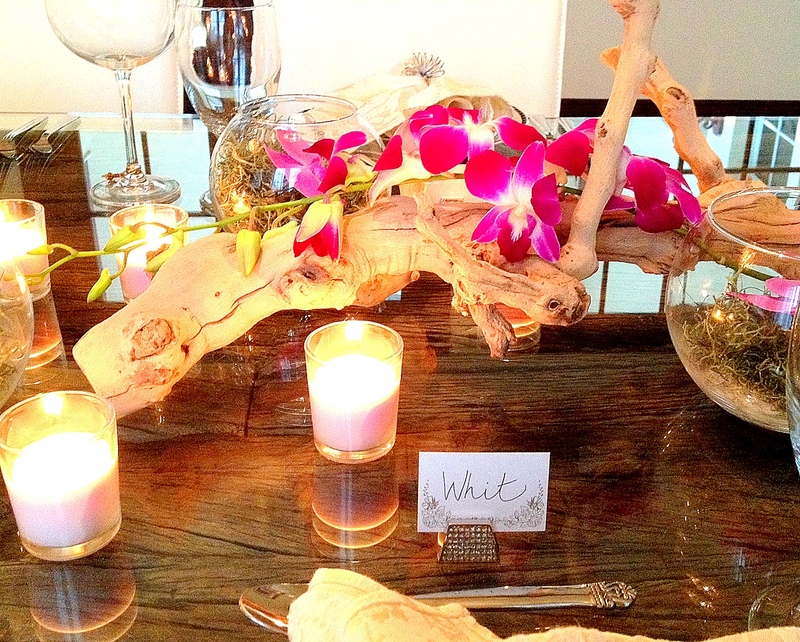 You really can't go wrong with a little creativity, and these details are the things that make your party unforgettable and special for you and your guests. What do you think of our chic and easy table setting? 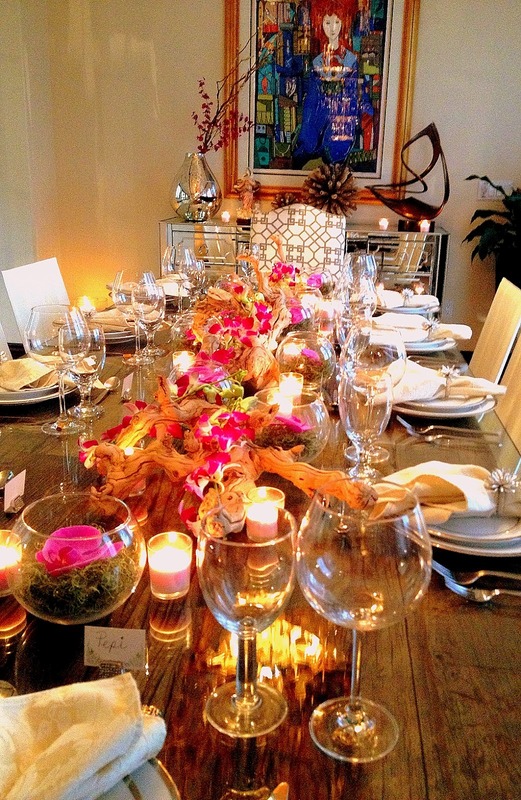 What are your tricks for entertaining and decorating for dinner parties?